Neodynetics has developed a prototype portable sensor system that instantly detects and identifies trace chemicals in water, and alerts the user to hazards and pollutants. System can detect and identify ultralow trace level chemicals including chemical warfare agents of interest at a vapor-phase concentration. The design is based on an advanced adaptation of Ramon spectroscopy that uses a proprietary, custom-fabricated surfaced enhanced substrate to greatly increase the Raman signal strength. Our battery operated, hand-held system rapidly pumps water samples in and out of a chamber where it contacts a nano-particle- coated substrate and is subjected to high intensity laser and Raman spectrometer analysis. The prototype increases the Raman signal by several orders of magnitude, surpassing other approaches for detecting and identifying ultralow quantities of trace chemicals in water. The prototype includes a newly designed precision microfluidic sampling pump that works in coordination with its fiber-optic Raman laser/spectrometer to provide rapid sample input and output for the device. 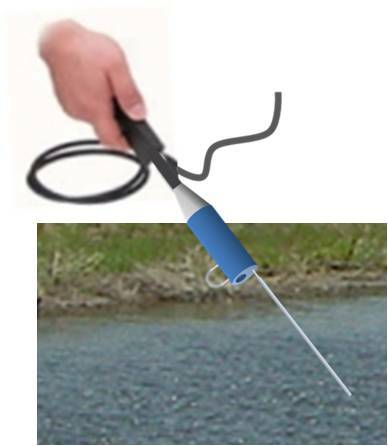 Operational tests demonstrate that this lightweight, battery-operated field-portable technology surpasses the competition and sets the stage for production of new and advanced products needed by military, police, security, medical and environmental organizations for rapid detection of water-based hazards at the source. Our custom-fabricated Raman SERS substrates use our patented nano-particle structure to create a nano-antenna effect that greatly increases the Raman signal for trace detection. This technology can enable new Raman sensors instruments to greatly outperform the competition in terms of chemical detection, identification and measurement capability. The technology is highly cost-effective and will serve many important markets related to national security, medical diagnosis, environmental control and others. The technologies currently used for security screening at airports and border check points can fail to detect trace amounts of explosives and illegal substances, especially if the airborne chemicals are well disguised. Therefore, a critical requirement exists to improve the performance of security screening technology for passengers, luggage, cargo and vehicles. Neodynetics is developing a new high performance, hand-held Raman sensor designed to increase signal strength sufficiently for ultra-low explosive trace level detection (EDT) in air samples. The ideal system would provide rapid, ultralow trace detection, high dependability, low cost and hand-held portability. Raman spectroscopy systems come closest to meeting this need but suffer from low signal strength that limits their trace level detection. Our system design contains a custom-fabricated, three-dimensional, multi-layered Surface Enhanced Raman Spectroscopy (SERS) substrate that greatly boosts the Raman signal, allowing it to detect the broadest possible range of trace particles in the air. As a hand-held explosives trace detection (ETD) system, it will provide portable security screening at airports and boarder crossings for baggage and cargo inspection, and become a practical, cost effective and indispensable tool for law enforcement. The system’s optically-based Raman system is designed to instantly detect and alert users to trace levels of contamination, explosives, chemical hazards and contraband in the air around passengers, clothing, baggage, personal items and electronic devices. Neodynetics has designed the core technology – an advanced, multi-layered, three-dimensional (3-D) SERS substrate that is needed to meet the requirement and we have the facilities and expertise to fabricate the necessary components. Each layer of the 3-D substrate will contain a precise nano-particle surface structure creating a nano-antenna effect that is the key to increasing the Raman surface enhancement factor by several orders of magnitude. The system’s multi-tiered design boosts detection capability even further because the sampled air flows over multiple nano-antenna-coated surfaces, each providing a increase in the Raman signal. With this design, chemical compounds cannot avoid interacting with the many nano-antenna hot spots that fill each surface layer. The system’s Raman spectrometer will create a strong spectrum profile “fingerprint” for each ultralow trace-level compound found in the air and the chemical fingerprint is used to match against an internal system database of known chemicals of interest for instant identification. This technology is expected to surpass canine capabilities to become a more practical and cost-effective detection tool since it requires only a hand-held, battery operated, device. Many military and commercial organizations require a high-performance system to monitor the chemical content of the air in enclosed environments such as mines, industrial buildings, military aircraft, submarines and cargo holds. The system needs to be highly reliable and cost effective while requiring low maintenance. To meet this need, Neodynetics is designing a new Raman spectrographic monitoring system that will advance the state of the art for detecting, identifying and accurately measuring ultra-low trace-level chemicals that current systems can’t detect. The system will also be programmable, so it can be easily adjusted through software changes to enable identification of a wide variety of target chemicals of interest. The technology will be small, compact and highly durable, requiring only minimal, inexpensive periodic maintenance, and the system will be easily integrated into many types of environments where atmospheric monitoring is required. When completed, the system will provide greater accuracy and dependability in the detection of trace level pollutants and hazards and provide an advanced, cost effective technology that is adaptable for supporting critical military, government and commercial sensor applications.